A pig-tailed macaque yanked at a coconut on a piece of string until it fell to the floor, a small victory for the simian student at a Malaysian school that trains monkeys to harvest fruit for farmers. 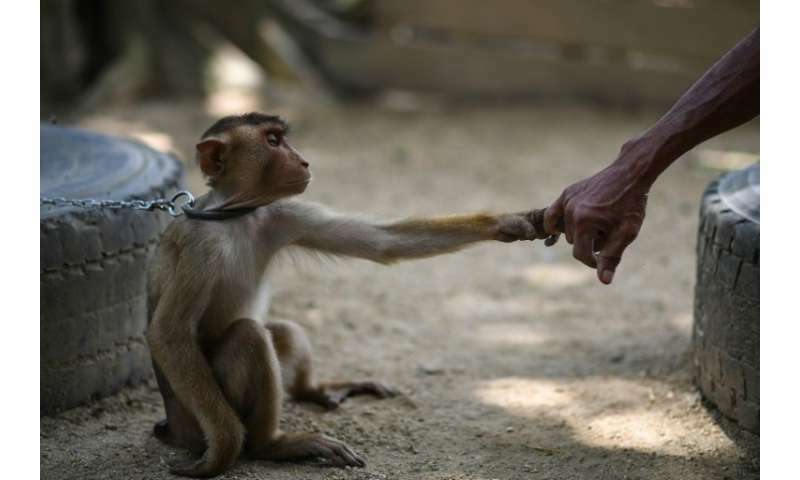 Thousands of monkeys have been taught the trade over the past four decades by a man known as Grandfather Wan in a small village in the north of the country. For a small fee people across the country send their macaques to the famed school, where they are put on thin chains like leashes, and trained to clamber up palm trees and pick coconuts. 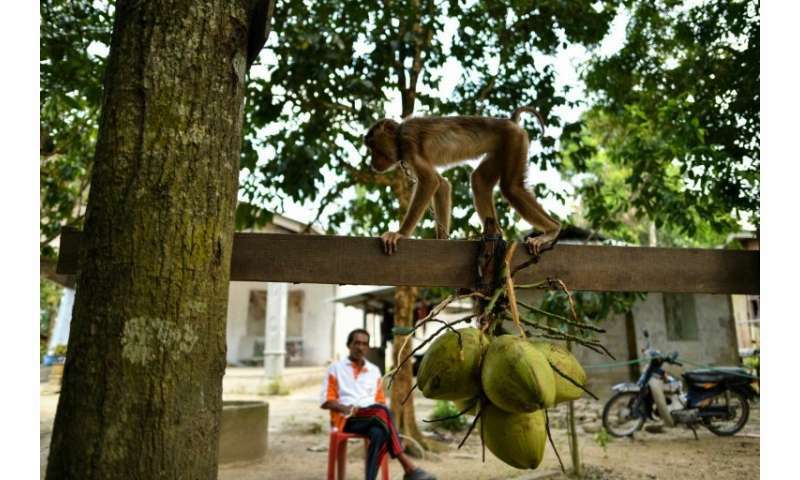 Teaching monkeys to pick fruit has in the past sparked protests from animal rights groups who have denounced it as cruel, but Grandfather Wan—real name Wan Ibrahim Wan Mat—insists he only ever treats his charges kindly. "They are like our children," said the 63-year-old, as macaques swung about and screeched in a training area consisting of a cluster of palm trees and some dilapidated wooden platforms for the macaques to climb on. "When they drop the fruits, we show them love. We stroke them." He trains southern pig-tailed macaques, a medium-sized monkey found across much of Malaysia, as well as parts of Indonesia and southern Thailand. They are mostly found in the region's rainforests but as their natural habitat has been destroyed by logging and human encroachment, the monkeys have increasingly strayed into villages and cities. Wan Ibrahim first became interested in macaque training in his early 20s when he spotted the creatures climb up coconut palms to pick the fruit. It was just a hobby to begin with but as he improved, word of his skills spread and people from far and wide started sending their macaques to him in the small village of Padang Halban in northern Kelantan state. Coconuts are big business in tropical Malaysia which produces some 700 million every year and the country is home to countless smallholders some of whom use monkeys to carry out the labour-intensive work of harvesting. Getting a monkey up to speed as a top-notch coconut picker can take anything from a few days to a month, depending on the animal, Wan Ibrahim said. But once fully trained they can pick up to 800 coconuts a day, which he said makes his fee of 150 ringgit ($38) for a full course well worth it. The course has several stages. The first is training a monkey to yank a coconut free that is attached by a piece of string to a wooden fence—aping the action of pulling one of the fruits from a coconut tree. The creatures are then trained to pull coconuts from a plank of wood raised a few feet above the ground, and the final stage sees them clambering up palm trees to collect the fruit. Mat Ali Zakaria, a coconut picker and customer from the town of Padang Rengas, more than 300 kilometres (180 miles) away from Padang Halban, praised Wan Ibrahim for his gentle training methods. "I've seen other people training macaques—sometimes if they don't want to take coconuts, the monkeys are dunked into a river," he said. Wan Ibrahim's business won't be around forever—he has slowed down since a stroke two years ago and now gets around with a walking stick. 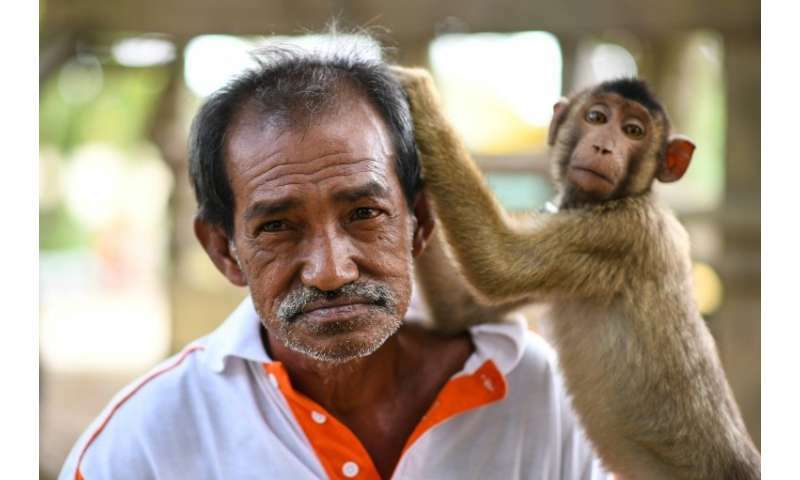 None of his five children are interested in taking over the training centre but he said there are other monkey trainers in Malaysia who will continue the work once he retires. Malaysian Animal Welfare Society president Shenaaz Khan said she was not against training macaques as long as it was not cruel, but raised concerns there was insufficient monitoring of the monkeys once they were returned to their owners. "When you use them as a labour force, they don't have protection. Who's going to look out for them?" she said.